This article is about the mineral. For the chromium(III) anion and its salts, see Chromite (compound). Chromite is an iron chromium oxide: FeCr2O4. It is an oxide mineral belonging to the spinel group. Magnesium can substitute for iron in variable amounts as it forms a solid solution with magnesiochromite (MgCr2O4); substitution of aluminium occurs leading to hercynite (FeAl2O4). It is by far the most industrially important mineral for the production of metallic chromium, used as an alloying ingredient in stainless and tool steels. A chromite prospect in Yukon. The black bands are chromite, which also carries platinum group metals. Gray rock is bleached ultramafics. Chromite is found as orthocumulate lenses of chromitite in peridotite from the Earth's mantle. It also occurs in layered ultramafic intrusive rocks. In addition, it is found in metamorphic rocks such as some serpentinites. Ore deposits of chromite form as early magmatic differentiates. It is commonly associated with olivine, magnetite, serpentine, and corundum. The vast Bushveld igneous complex of South Africa is a large layered mafic to ultramafic igneous body with some layers consisting of 90% chromite making the rare rock type, chromitite. The Stillwater igneous complex in Montana also contains significant chromite. 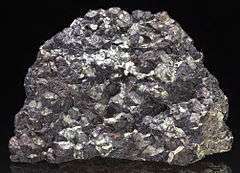 The only ores of chromium are the minerals chromite and magnesiochromite. Most of the time, economic geology names chromite the whole chromite-magnesiochromite series: FeCr2O4, (Fe,Mg)Cr2O4, (Mg,Fe)Cr2O4 and MgCr2O4. The two main products of chromite refining are ferrochromium and metallic chromium; for those products the ore smelter process differs considerably. For the production of ferrochromium the chromite ore (FeCr2O4) is reduced with either aluminium or silicon in an aluminothermic reaction and for the production of pure chromium the iron has to be separated from the chromium in a two step roasting and leaching process. Chromite is also used as a refractory material, because it has a high heat stability. In 2002 14,600,000 metric tons of chromite were mined. The largest producers were South Africa (44%), India (18%), Kazakhstan (16%), Zimbabwe (5%), Finland (4%), Iran (4%), and Brazil (2%), with several other countries producing the rest of less than 10% of the world production. Afghanistan has significant deposits of high grade chromite ore, which is mined illegally in Khost Province and then smuggled out of the country to Pakistan. In Pakistan, chromite is mined from the ultramafic rocks in mainly the Muslimbagh killa Saifullah District and Khanozai area of Pishin District of Balochistan. Most of the chromite is of metallurgical grade with Cr2O3 averaging 54% and a chrome to iron ratio of 2.6:1. Recently, the biggest user of chromite ore has been China, importing large quantities from South Africa, Pakistan, and other countries. The concentrate is used to make ferrochrome, which is in turn used to make stainless steel and some other alloys. In April 2010 the Government of Ontario announced that they would be opening up a large chromite deposit to development in the northern part of Ontario known as the Ring of Fire. This plan has since been suspended. 1 2 Klein, Corneis and Cornelius S. Hurlbut, Manual of Mineralogy, Wiley, 20th ed., pp. 312–313. ISBN 0-471-80580-7. ↑ Gu, F; Wills, B (1988). "Chromite- mineralogy and processing". Minerals Engineering. 1 (3): 235. doi:10.1016/0892-6875(88)90045-3. ↑ Papp, John F.; Lipin Bruce R. (2006). "Chromite". Industrial Minerals & Rocks: Commodities, Markets, and Uses (7th ed.). SME. ISBN 978-0-87335-233-8. ↑ Routschka, Gerald (2008). Pocket Manual Refractory Materials: Structure - Properties - Verification. Vulkan-Verlag. ISBN 978-3-8027-3158-7. ↑ "Chromites of India" (PDF). ↑ Papp, John F. "Mineral Commodity Summary 2006: Chromium" (PDF). United States Geological Survey. Retrieved 2009-02-24. ↑ Papp, John F. "Minerals Yearbook 2006: Chromium" (PDF). United States Geological Survey. Retrieved 2009-02-24. ↑ Bowley, Graham (2012-09-08). "Afghans Wary as Efforts Pick Up to Tap Mineral Riches". The New York Times. ↑ "How Products are Made, Vol. 1". Retrieved 29 Dec 2010. ↑ "YouTube - premierofontario's Channel". YouTube. Retrieved 2010-04-13. ↑ "Cliffs suspends Ring of Fire project in northern Ontario". CBC News. Retrieved 2013-11-28. Wikimedia Commons has media related to Chromite.